Last time I mentioned that there are a considerable number of other types of metal purse frames, including some that are truly odd, and some that are totally over the top. So first let’s start with an odd one. This next purse belongs to the Museum of London and dates from the 14th or 15th century. It has a single metal support bar. The leather, which is original, is cut in an unusual asymmetrical shape and is beautifully tooled. Be sure to look at both of the pictures, the back is plain, but the front has two incised hearts with lattice patterns. There are no metal purse frame rings or attachments and no obvious indication that there ever were any. The leather is attached directly to the support bar. I would love to be able to see an x-ray of this piece to determine if the original attachments were simply broken off and the support bar was reused, or if it was actually designed that way from the beginning. After a simple purse like this is seems appropriate to go in a completely opposite direction – all the way to the over-the-top luxury purse. This purse belongs to the British Museum. It is dated to around 1450 and is believed to have been manufactured in France or Flanders. 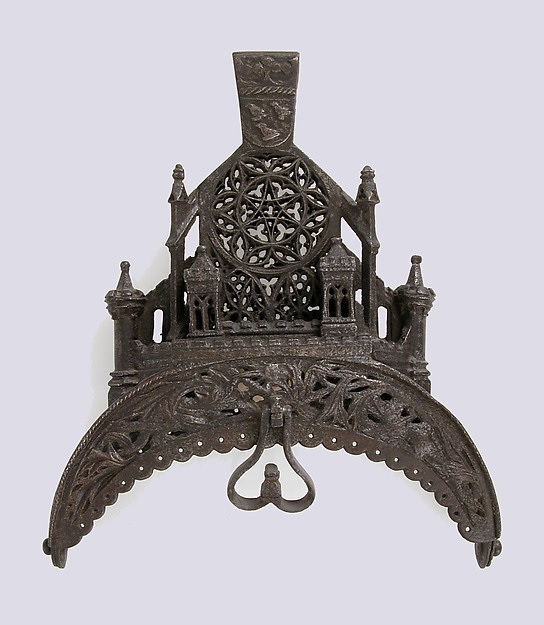 The British Museum actually dismantled the purse frame as part of an effort to conserve the piece, which does show some damage from previous conservation actions. You will notice that this purse frame has even more rings than usual. The smaller partial frame would have created an additional pocket in the purse. The artifact listing has something like nine pictures, including pictures of the purse while it is taken apart. It is a really nice, and fairly elaborate purse frame, but NOT the fanciest that I have seen. Here is a purse that belongs to the Metropolitan Museum of Art. Made of Iron – a material that most people do not think of a being capable of delicate detail. The top of the purse is a true masterpiece of the iron worker’s art. And just so that you don’t think that this purse is the only one of its kind, here is one from the Metropolitan Museum of Art collection that is even more magnificent. This piece is also made of iron, and was probably made in France. I have actually seen several of these elaborate “rose window” purse frames in my travels, and they are really quite amazing. And then there is this purse from the Museum of London. It is a simpler form than the previous two purses, more like the original simple purse frames that we looked at, but the level of decorative detail is outstanding. The Niello decorations and words on the frame are truly masterful. It also shows us another form of purse frame rings that was fairly standard during the 1500 and 1600’s. Be sure to enlarge the image so that you can see the details! This entry was posted in Dress Accessories, Leather Purse or Belt Pouch With Brass Frame, SCA Life and tagged bronze frame purse, iron frame purse, Medieval purse, Medieval purse with metal frame by Eirny. Bookmark the permalink.